How can I enable Textlocal SMS API? If you are looking for a platform that will allow you to send bulk SMS messages to your customers, especially in United Kingdom and India, then Textlocal is the perfect choice! If you are looking for a SMS platform at an international level (and specifically for United Kingdom) then Textlocal.com is the right fit for you. UK customers will be able to send bulk SMS at way cheaper rates via Textlocal. How to set this up? Setting up Textlocal API in RepairDesk is a piece of cake! 1. First, create your account on Textlocal. Note: Sign up on textlocal.com for worldwide SMS reach. Indian customers can sign up to textlocal.in if they desire to send bulk SMS in India only. 2. Log in to RepairDesk. 4. 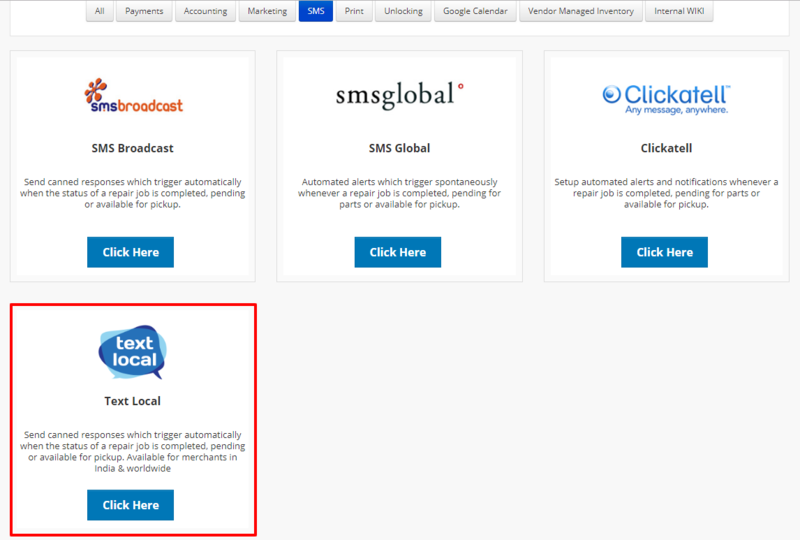 Click on Integrations and select Textlocal from the list. 5. You will be directed to following page. On the Textlocal API configurations page, activate Enable API trigger. 6. Enter your business name. Copy the API token key from Textlocal account and paste it in Enter API Key field. 7. Select region from the dropdown menu. Choose Worldwide for Textlocal.com account or India for Textlocal.in account. 8. Click on Save Changes button to implement API settings. 9. Once connected successfully, you will get the message displayed “API Connected” as shown below. 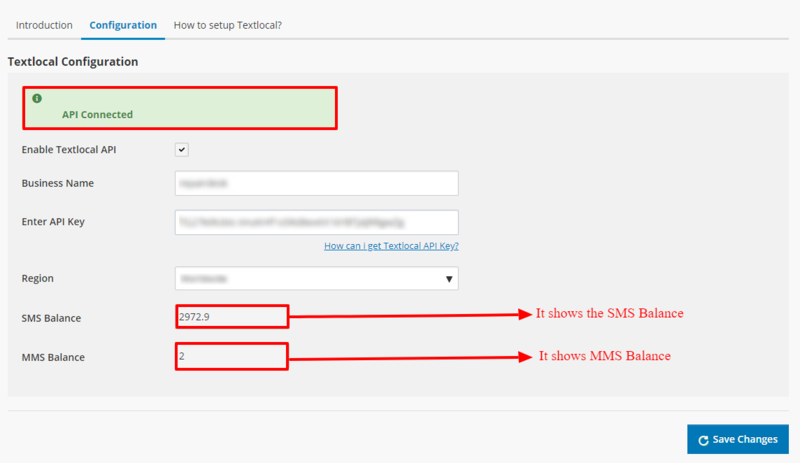 It will display the SMS and MMS balance from your Textlocal account to RepairDesk account. Q. How long the Sender Name should be while using Textlocal.com (international)? A. While using Textlocal.com (international), you can enter sender name under the Business Name field. This field is used to specify which sender name will appear in the text message. This name can be between 3 to 11 alpha-numeric characters or up to 13 numeric characters. Q. What is the character limit for sender name while using Textlocal.in (India)? A. While using Textlocal.in (India) you can specify sender name up to 6 alpha characters under Business Name field. Do not send this parameter if you're using a promotional account. This 6 character sender name should be approved by Textlocal, otherwise your messages will not be sent. If your sender names are not approved yet, you can use default sender name 'TXTLCL' to send text messages via Textlocal API. Note: Approval for sender name is applicable only for Textlocal.in (India). Q. Is it possible to disable the integration once enabled? How do I enable Clickatell SMS Gateway? How can I Setup SMS Broadcast API? How can I send Job alerts via SMS? How do I enable 2 way SMS at Clickatell SMS Gateway?